Consign-A-Car Pty Ltd is a licenced Motor Dealer in Queensland and our sole business is Consignment of privately owned vehicles. Put simply WE SELL YOUR CAR FOR YOU. Consign-A-Car has been in business since 1999, both in Brisbane and the Gold Coast, we have been a member of the MTAQ for this same period. A family run business that since its inception has grown in size and experience, now offering collectively over 100 years Car Industry knowledge and experience. Our dealership understands that the Used Car industry for far too long has had the best of both worlds, buying and trading cars for wholesale and selling for retail. Our Company is here to assist you to get more money for your car by selling it through one of our specialist dealerships. We specialise in Consignment therefore our full focus is on all vendors cars here on consignment only. Consign-A-Car can assist both the private seller or business to sell their cars, we can even accommodate the disposal of business fleet which in turn assists with obtaining the best price on your next fleet. 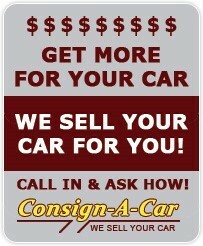 For a small upfront fee we will take care of all of your cars advertising and marketing required to sell your car. We sit down, discuss your desired price and on successful sale of your vehicle a small percentage of sale price is charged for our services (i.e. Finance, Trade In, Warranty). How many of us have tried selling our cars privately, spending good money on advertising for few or no enquiries, and when you do get an enquiry, you get ridiculously low offers. The major problem with selling privately is that you cannot offer the purchaser finance, a warranty or in most cases take a trade-in. We also have Government Departments recommending buying from a Licenced Motor Dealer for protection and guaranteed title. This all works against the private seller making a sale very difficult, if not impossible. Our objective is to work with vendors to achieve the highest price possible for their car. As our payment is a small percentage of this price, we are fully committed to achieving that goal. Our dealerships work within the guidelines set by the Department of Fair Trading to ensure that at all times our customers and vendors are protected. All transactions are done via Trust Account to guarantee accountability and ensure vendors receive the accepted price for their vehicles.